Every Christmas we enjoy getting together for an annual homemade gingerbread party. My sister in law has her gingerbread making down to a science. Lucky for you I am sharing the recipe she uses with you today! I am also sharing with you 10 easy steps of how to throw a gingerbread party that is easy and fun. Now, you certainly do not need to make the gingerbread houses yourself, you could buy simple kits without having to make your own. A huge thank you to Whisps for Partnering with me on this post and party. They spoiled us rotten and we had so much fun snacking and enjoying Whisper the Elf. First, we make the party one that will be enjoyed by both adults and children alike. We don’t always make homemade food, and this helps cut down on the stress of the prep. In years past we have all brought a homemade soup to share, pizza, pulled pork sandwiches, or an instant pot favorite. This year we made things really simple and did pizza for the kids and take out Mexican food for the adults! I also put together a delicious snacking cheese/cracker tray so the adults had something delicious to snack on rather than getting a massive sugar high. I used Whisps as a perfect addition to this cheese tray as they are made with 100% natural cheese and premium spices. Make the food easy and divide up the assignments. Keep decorations simple and fun. Since I was the one hosting this year I was in charge of set up and decorations. I set up separate tables for each of the families and even set up a small photo center for us to take a picture with when we were done with our creations. Assign each family to bring candy to share. For us, we are dividing up the task between three families so 5-7 different types each is plenty. Buy cheap candy! We love to hunt at the dollar store for favorites for a fraction of the cost. Think easy things to decorate with: Skittles, M&Ms, Smarties, Froot Loops, licorice, Frosted Mini Wheats, and candy canes. Put together snacking options that adults will enjoy so that they are less tempted by all of the treats. Securing the foundation and walls is the most important part for parental involvement, beyond that let the kids go wild. We decorate a gingerbread house per family and take a picture together with it after the fact. It is a really fun way to work together as a family. Play some festive music and let the decorating begin. Be silly. One year our whole house caved in and we decided to make it into an indoor swimming pool. We filled up the house with blue candies and make little gingerbread people to swim around inside. 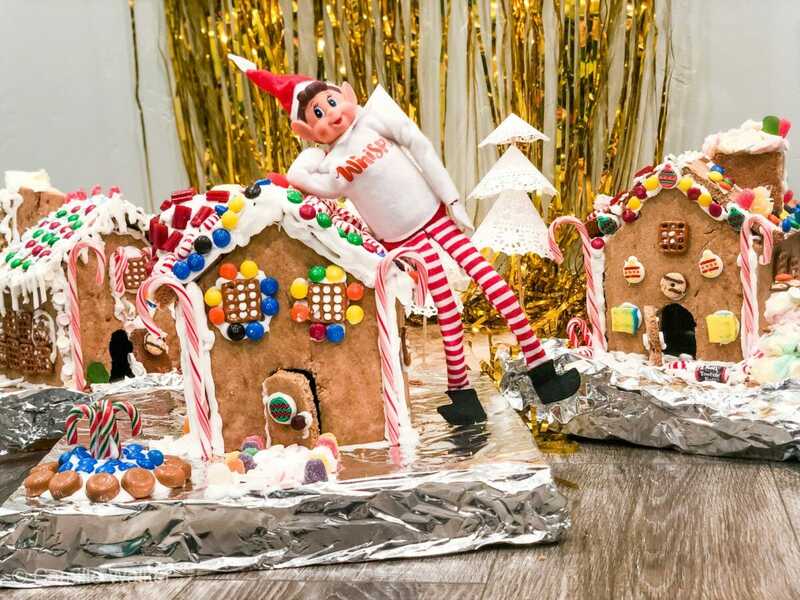 You could also consider doing a theme for the gingerbread houses where everyone adds something special to make a little story around the house. Have fun. Our kids just want to play with us and have time to make memories. This has been an activity that always puts a smile on our faces. Here is an idea of how you can make a gingerbread house cutting it out of a pan with detailed instructions. Emmy's Homemade Gingerbread Recipe, this gingerbread recipe has few steps and works out every time! We love it. Let cool, then use house pattern to cut out rooftop pieces, walls, and a door. We hope you’re having a wonderful December so far! Make sure to check back on instagram to see how we are going to help raise money with Whisper the elf under hashtag #WhisperGoneWild!